They grow up so fast, but she'll always be your little princess. Hold onto those precious moments just a little bit longer with this three-piece gift set that arrives packaged gift-ready in a charming carriage that's fit for royalty. No need to speed away at midnight, baby girl will be the belle of the ball for all occasions! Darling princess pink, capped-sleeve bodysuit with white polka dots and a soft, fluffy skirt; ruffled bib is adorned with pretty pink rosette; burp cloth is dressed up with tulle trim for a regal touch. 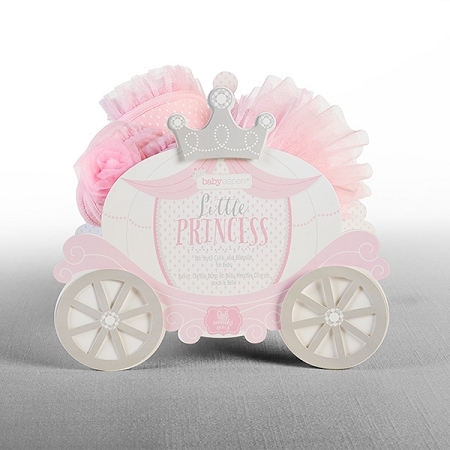 Gift set comes tucked in coordinating pink and white polka dot "Little Princess" carriage and the box Gift box measures 10" h x 12"w x 6"d.